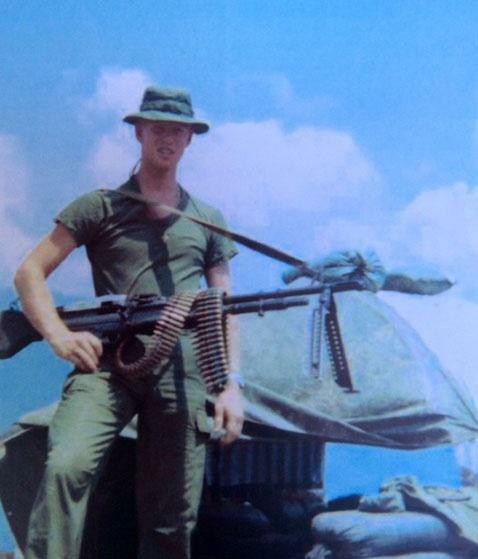 Title: "Through the Eyes of a Soldier - My Vietnam Experience"
I grew up in Jennings, MO. I attended Corpus Christi grade school, CBC High School and St. Louis University. In 1967 I graduated from the university with a Bachelor of Science in Commerce with a major in Finance. I obtained full-time employment with the FDIC as a bank examiner until I was drafted into the U.S. Army in early 1968. After Advanced Infantry Training, I entered South Vietnam in October, 1968 and was assigned to the Americal Division in Chu Lai, located in the southern part of the I Corps in the Central Highlands. From there I was assigned to my unit which was the 11th Light Infantry Brigade. I eventually ended up in the 2nd platoon of Company A, 3rd Battalion of the 1st Infantry. Our company’s base camp was LZ Bronco out of Duc Pho in Quang Ngai Providence. My unit’s Area of Operation (A0) included the lowlands along the South China Sea, which included villages in the tree lines and rice paddies, to and including the mountains between South Vietnam and Laos. During my first seven months in country I carried an M-16, walked point for my unit when it was my turn, participated in setting up ambushes and patrolled our AO. At times we were in the field, or “bush” as we called it, operating as a company or a platoon or only as a squad. During this time period, I experienced walking point (lead man in a column), booby traps, ambushes and firefights. At various times I was on the receiving end of Rocket-Propelled Grenades (RPGs), mortar shells, hand grenades, and bullets from AK-47s, M-16s and machine guns. During enemy contacts we called in air and artillery support, depending on the nature of the contact. The air support was provided by jets and/or Huey helicopters, which we called “gunships.” My worst day in the field was in November, 1968 when my platoon lost eight or nine soldiers in a firefight and I was trapped between the enemy and my platoon’s position, while trying to drag a wounded man, a machine gunner, out of harm’s way. In July, 1969 I was assigned to civilian affairs for the Battalion and became a captain’s assistant. I continued carrying my M-16 and was still exposed to sniper fire, road mines during the day and rocket attacks on fire bases at night, but I was no longer operating with an infantry unit. In October, 1969 I departed South Vietnam and safely arrived home. After an honorable discharge in February, 1970 I began my Master’s program at St. Louis University and returned to employment with the FDIC. With banking being my profession, I eventually retired from UMB Bank as Executive Vice President and senior credit officer in the St. Louis Metropolitan area. My wife Mary and I raised 5 children and now enjoy 12 grandchildren. At the request of our son, John, I wrote my Vietnam Memoirs in 2004. It was accepted by the Veterans History Project in the Library of Congress.